Start or join your audio meeting with a tap of the screen. Trigger our Call Me feature to initiate a call to one of your stored phone numbers or dial right into your meeting with no hassle. Schedule meetings and invite participants with an email that includes meeting details and a tap-to-join link that automatically connects to your meeting. Receive a push notification when someone first enters your waiting room and again after five minutes of inactivity as a reminder to start your meeting. See when you have a free moment or the ability to schedule a meeting by using the in app calendar to view appointments scheduled in your device’s native scheduler. Use Voice Over IP to talk and control your meetings on your smartphone when travelling internationally to avoid high roaming costs. *Voice Over IP is charged at the same rate as your local dial in rate. Once you have downloaded SmartMeet from the Apple App Store or Google Play, follow the instructions below and you’ll be on your way to a mobile meeting experience. On the Welcome screen, enter your name and email address. Tap Phone Numbers and add one or more numbers. These will be used to allow SmartMeet to dial-out* to you to start or join your call. If desired, toggle Password Protection on and select a unique combination of letters and numbers. On the following screen, if you want to start meetings with your SmartMeet account, enter your Conference Code and Leader PIN. By default, Call Me is an enabled featured, but you have to option to toggle this on or off. If enabled, select whether or not you would like push notifications for your SmartMeet account. Do I need a Reservationless-Plus account to use SmartMeet? No. You can use SmartMeet to join meetings without an account. However, to schedule, start and host meetings through SmartMeet you do need an Message Stick account. Does SmartMeet Support Unified Meeting? SmartMeet allows you to schedule, start and join the audio and visual presentation portion of a Unified Meeting conference. Video is currently unavailable in SmartMeet, but will be added in a future release. Can I start and join meetings on my desktop? 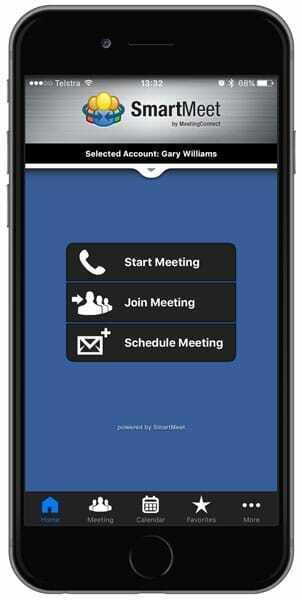 Meetings scheduled with SmartMeet can be started or joined using Call Manager, our desktop application for Message Stick conferencing accounts. Which tablets are supported by SmartMeet? Currently, SmartMeet is supported for iPads and some Android tablets. Does SmartMeet support Windows Phone or Blackberry devices? No. SmartMeet does not currently support Windows Phone or Blackberry devices.